Secluded and Romantic cabin near Cookeville and Crossville, Tenn.
'Lazy Days' is the third cabin we built on 60 private acres of property here in the small Mennonite community of Muddy Pond. It was a priority for us to maintain seclusion for each cabin while finding a beautiful spot for building. We decided on a hemlock ringed area with just a short walk out to a private gazebo set out on the same 2 1/2 acre pond as Whippoorwill Hideaway shares. We believe you will fall in love with this beautiful, peaceful oasis where you can sit on the porch and do absolutely nothing without any guilt. 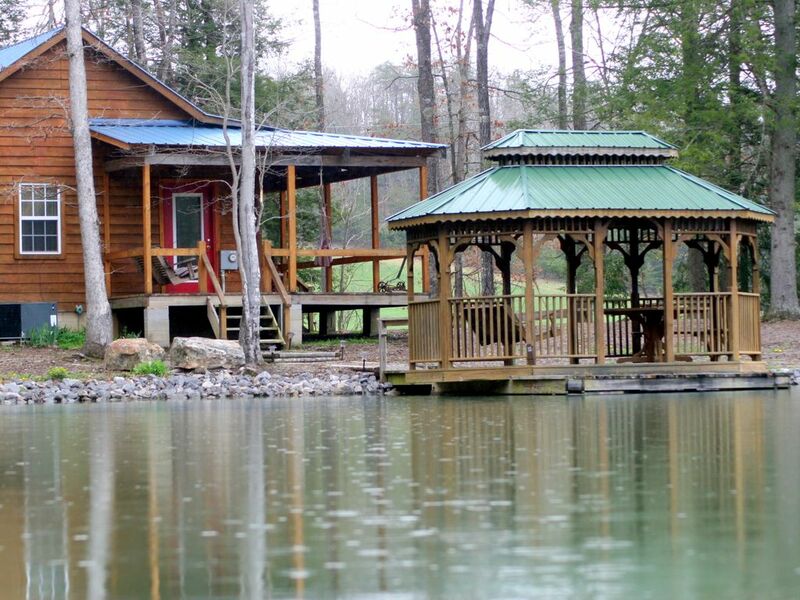 If you enjoy fishing then you'll appreciate the dock by the gazebo where you can fish for bass or bluegill. The cabin is only built for 2 and is one open room except for a central fireplace and the private bathroom. It includes a king-size bed with a two-person Jacuzzi beside it. The living room is cozy and you can bring videos to watch on a DVD or VHS player for the quiet evenings. The full back porch is supplied with rockers and a view that is beautiful. Just a short walk over a little bridge leads to a gazebo out on the water where you can fish or sit in the porch swing. As soon as you turn in the winding country road tightly hemmed by evergreens you will begin to feel the difference in atmosphere. You've come apart from the rest of the world and this time is just for you - just the two of you. We live in and the cabin rental is surrounded by the small Mennonite community of Muddy Pond. There are unique shops here and some good eating at the General Store, Country Porch and Bachen Haus. Horse lovers will enjoy the Leather Shops and nature lovers will appreciate the serenity and natural beauty that is all around. In the fall watch the old time sorghum mills operate. If you've made this your vacation destination than you may want to go farther afield to the Big South Fork which offers: Horseback Riding, Fishing, White Water Rafting and Hiking; or to Fall Creek Falls, Picket and Cumberland State parks which have: Scenic Trails, Swimming and Boating; Local Wineries, Historic Sights of the Cordell Hull birthplace, Alvin York home place or historic Rugby . The Cumberland is alive with history and beauty. It's a place to relax and reflect and become acquainted with the real Tennessee. Step back to a simpler time and create a precious memory. Activities at the Cabin: Sitting on the porch rockers watching the birds, Relaxing on the hammock enjoying the beautiful view, walking down quiet lanes, Reading good books, Fishing, In the community: Sightseeing while leisurely driving the back roads, watching old time sorghum cooking in the fall, Browsing crafts and bulk foods at the general store, Checking out neat things and gifts at the Leather shop, Variety Store or Country Porch. Farther away: Big South Fork which offers, White Water Rafting and Hiking, Fall Creek Falls, Picket and Cumberland State parks have, Scenic Trails, Swimming and Boating, Local Wineries, Historic Sights of the Cordell Hull birthplace, Alvin York home place and historic Rugby are nearby. Crossville is famous for the golf courses and the Cumberland County Playhouse. The main activity here is relaxing and listening to the sounds of silence. If you are looking for a place to relax and get away from everything this is the place. We loved it and can’t wait to come again. Beautiful area. Cute little town. The cabin was relaxing and exactly what we were looking for. Thank you for coming and for taking time to write a review. Come again! Had a great peaceful weekend. Beautiful property and lake. Would recommend it for a getaway. Thank you so much for your review, and for being our guest! We appreciate it, and hope you can come again. We loved the Lazy Days Cabin, it was so nice and relaxing. It had everything we needed, we took long walks during the day and had nice big bonfires at night. We enjoyed sitting on the porch just listening to the sounds of nature. What a great place to unwind. Thank you for coming, and we hope you come back soon! I loved it here at the Cabin, sooo Beautiful and Peaceful!! My stay was Amazing!! I'm so glad you enjoyed your time here, and we hope you can come back soon! God's beautiful nature has a way of soothing our souls and refreshing us. The cabin was very clean, cozy, peaceful and relaxing. We had a phenomenal time relaxing and getting a break from our hectic daily lives. Thank you for coming, and for taking time to write a review. In the community: Sightseeing while leisurely driving the back roads, watching old time sorghum cooking in the fall, Browsing crafts and bulk foods at the general store, Checking out neat things and gifts at the Leather shop, Variety Store or Country Porch. Farther away: Big South Fork which offers, White Water Rafting and Hiking, Fall Creek Falls, Picket and Cumberland State parks have, Scenic Trails, Swimming and Boating, Local Wineries, Historic Sights of the Cordell Hull birthplace, Alvin York home place and historic Rugby are nearby. Crossville is famous for the golf courses and the Cumberland County Playhouse. The main activity here is relaxing and listening to the sounds of silence.